As commissioned (and recorded) by the SWR Big Band of Stuttgart, Germany, this chart is another superb Curnow arrangement of the music created by the Pat Metheny Group. Bob Curnow has written some marvelous arrangements of Metheny/Mays music in the past, and this chart will surely "tug at your heartstrings. Here is a slow, swinging, lovely, warm, relaxed composition. This beautiful ballad is featured on Pat's newest recording Secret Story, and has been scored to highlight solo statements by flugelhorn, guitar or alto saxophone (your choice). Bob Curnow continues to add to his catalog of arrangements of Metheny & Mays compositions. Bob Curnow is very well known for his wonderful arrangements of Metheny's music, and this chart will only enhance that reputation. This is Lyle at his wildest!! A funk/rock, quirky tune that just burns with energy and excitement! Listen to the Curnow Big Band CD. Here is another fantastic Metheny/Mays masterwork, orchestrated by Bob Curnow. Bob Curnow is well known for his orchestrations of Pat Metheny's music, and this arrangement will fit right in with The First Circle and Minuano. Pat Metheny is known for his beautiful melodies, and "Back In Time" is no exception. From the pen of one of the very best arrangers, this chart just SINGS with optimism (hence the title?) and joy. Sierra Music publishes 10 of the Metheny/Mays charts on this sensational CD! This piece was never recorded by the Pat Metheny Group. This ballad is almost spiritual in its effect!! A trombone feature, the melody soars throughout. Eighteen is a flat-out, rock n' roll chart based on a tune from one of Pat Metheny's earlier albums, "Offramp. This piece is the essence of the clever, unusual, unforgettable kind of tune that Pat and the Group come up with. A Percussion Ensemble arrangement of this amazing piece. The LP The First Circle contains some of the most exciting contemporary music ever created. This arrangement was commissioned by New Trier High School and written as a tribute to Jim Warrick on his retirement. Bob Curnow brings you yet another epic Metheny/Mays masterpiece. Another great chart to add to the ever-growing Pat Metheny Series, Bob Curnow has arranged this down-right funk tune originally recorded on the PMG album We Live Here. This arrangement is a bit easier than the Pro version because it does not change keys (to C# minor). This is a TERRIFIC tune, full of the happy, spirited, hip melodic and harmonic stuff that we've all come to love about Pat's music. If you know "The First Circle" or "Minuano," then you'll have some sense of what this incredible composition is all about. Set as an easy-going rock feel, this Pat Metheny and Lyle Mays composition is sure to be a band and audience favorite. This arrangement is easier than the Pro version. Pat plays this at just about every concert of the Group. This is one of Pat's most haunting, pensive and beautiful ballads. Percussion Ensemble version of this great Metheny tune. A BEST SELLER!!! Metheny's tunes and rhythmic feels are perfect for Big-Band settings. Bob Curnow does his usual stellar job of arranging Pat Metheny's very popular tune "James," and he manages to add a lot of his own ideas to the arrangement. This arrangement does not include brass or drums. Metheny's ballads are beautiful and haunting. This is another Masterwork by Metheny and Mays and destined to become the same kind of classic as The First Circle . A Percussion Ensemble arrangement of this amazing piece. As commissioned (and recorded) by the SWR Big Band of Stuttgart, Germany, this is an extended arrangement based on a gorgeous melody by Pat Metheny. 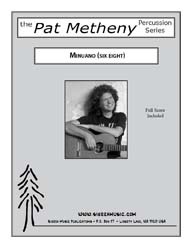 Pat Metheny writes superb ballads. A Percussion Ensemble version of this wonderful Metheny piece. Bob Curnow has written some marvelous arrangements of Metheny/Mays music in the past, and this chart surely belongs to that wonderful "new" big band literature he has created with such pieces as "The First Circle" and "Minuano. 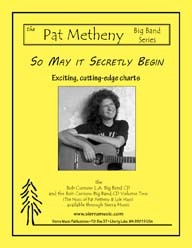 This arrangement features tenor saxophone and guitar, and the chart captures the excitement of this marvelous tune from Pat's Secret Story CD. This piece was originally recorded on the Still Life (Talking) CD and is a lovely bossa nova-ish style of chart. Here is another wonderful Bob Curnow arrangement of Metheny/Mays music. Bob Curnow continues to add to his Pat Metheny Big Band Series with this wonderful light, laid-back, Latin-rock chart. Another amazing, exciting chart has been added to the Pat Metheny Series! Bob Curnow's arrangement of Metheny/Mays' composition "Stranger In Town" hits you in the face right from the start and ends in the same manner. Bob Curnow has a way of picking out the Metheny tunes that work so well in a big band setting. Sierra Music publishes all 11 charts on this fantastic CD! Pat Metheny is the master at composing moving, gorgeous ballads, and Too Soon Tomorrow is no exception. Here is another marvelous collaboration of Pat Metheny/Lyle Mays music as arranged for big band by Bob Curnow. You was originally recorded by the Pat Metheny Group on the CD Speaking of Now.